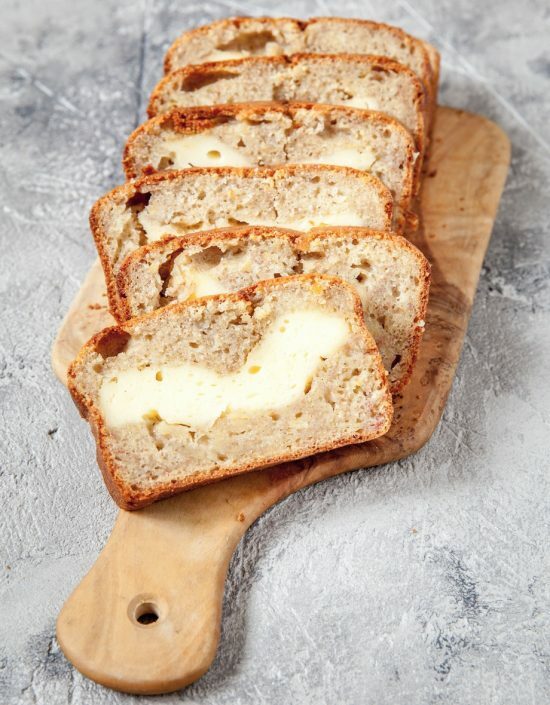 What could be better than delicious Banana Bread except perhaps stuffed with Cream Cheese! This is one recipe that you won’t to want to miss. Watch the video now. There is nothing quite like the smell of fresh banana bread baking in the oven – unless of course, you’re making this scrumptious Cream Cheese Banana Bread! Made with a delicious swirl of sweetened cream cheese filling, this loaf is more like a slice of banana bread cheesecake. It’s as simple to make as any other banana bread recipe too. Tasty are the creators behind today’s video tutorial and they have a Cookbook that is filled with their latest and greatest recipes. If you are addicted to their great ideas, this is for you. It would make a terrific gift for a foodie friend too. Get your copy here. We’ve included this very popular Tasty video that shows you how it’s done. You first make the banana bread and then the cream cheese filling. A dollop of Greek Yogurt is added to the loaf for an extra-moist density. You will be baking your bread in a 350˚F/180˚C and a greased 9×5-inch loaf pan for about 40-50 minutes. You can test for doneness by inserting a toothpick in the center and seeing if it comes out clean which means the bread is done. Allow your loaf to cool at least 15 minutes before slicing. Check out our popular banana recipes here and you can grab the full printable instructions for this cream cheese banana bread on Tasty here.